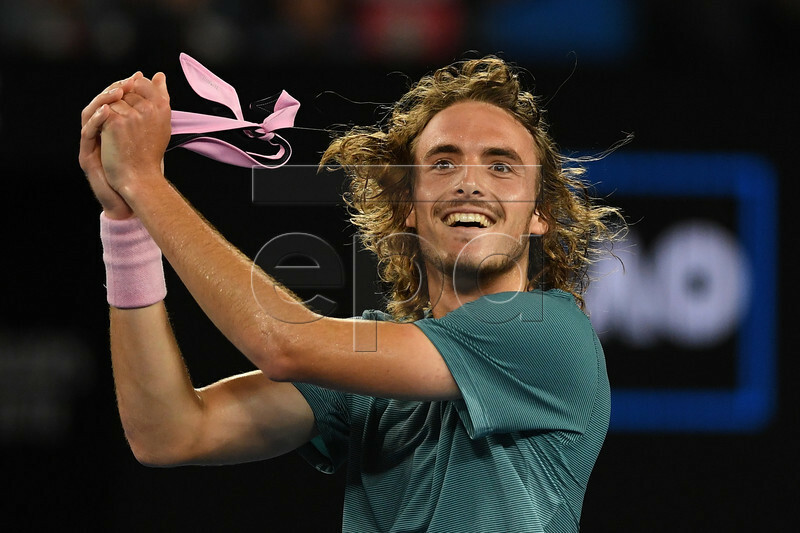 Okay, enough of the tomfoolery; this is no joke: in a huge upset on Sunday night, Stefanos Tsitsipas ousted two-time defending Australian Open champion Roger Federer 6-7(9), 7-6(3), 7-5, 7-6(5). The 20-year-old Greek cracked 20 aces and did not drop serve a single time while pulling off the biggest win of his career in three hours and 45 minutes during fourth-round action in Rod Laver Arena. But the most important statistic for Tsitsipas–and for Federer, too–was obvious: 12 break points against the Tsitsipas serve, 12 won by Tsitsipas. Pressure? What pressure? Tsitsipas saved eight break points in the second set when a two-set deficit at the 37-year-old Swiss’ hands would have spelled almost-certain doom. He stole that set in another ‘breaker and then broke Federer for the first and only time at 6-5 in the third to seize an improbable lead. A third tiebreaker also had to decide the fourth, at which point the world No. 15 gained an upper hand at 5-5 when Federer erred on a forehand that was challenged but shown to be inches long. That gave Tsitsipas match point on his own serve, which he converted by forcing the 20-time major champion into an error with a huge inside-out forehand. Tsitsipas’ reward is a surprising QF contest against Roberto Bautista Agut, who is in the midst of a borderline miracle run of his own. The Spaniard has won three matches in five sets, including hard-fought victories at the expense of Andy Murray (R1) and Marin Cilic (R2). The other quarterfinal on the bottom side of the draw features another up-and-coming star in Frances Tiafoe. The American celebrated his 21st birthday on Sunday by beating Grigor Dimitrov in four entertaining sets to set up a showdown with Rafael Nadal. Ricky contributes to 10sballs.com and also maintains his own tennis website, The Grandstand. You can follow him on twitter at @TennGrand. Copyright © 2010 - 2018 10sBalls.com. All Rights Reserved.